The governor’s office has selected four affordable housing projects in Central Brooklyn to receive state funding. 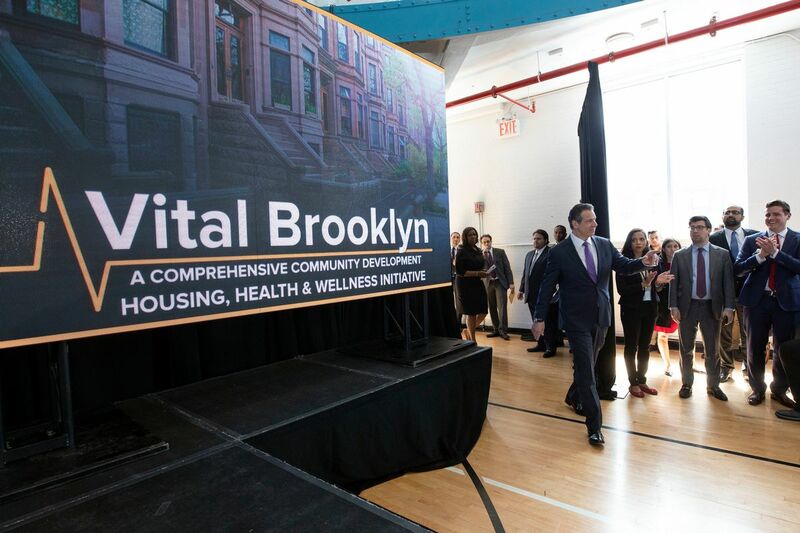 As part of his $578 million Vital Brooklyn initiative, which aims to bring 4,000 affordable homes to the borough, Gov. Andrew Cuomo issued a request for proposal in July, asking developers to pitch housing projects that could make use of the state’s funds. Totaling more than 2,700 affordable units, the chosen developments will be built on current or former hospital properties and will include support services for the elderly and other at-risk groups. Health and wellness also were focal points in the request for proposals. The first chosen project is a partnership between Apex Building Company, L+M Development Partners, RiseBoro Community Partnership and Services for the Underserved. Their $1.2 billion proposed redevelopment of the former Brooklyn Development Center site included 2,400 units in East New York for households earning no more than 80 percent of the Area Median Income. Of that, 45 percent will go to households earning no more than 50 percent of AMI, 207 would be held for the formerly homeless and 156 would go to seniors. CAMBA, a Brooklyn-based non-profit, was the second proposal selected. It called for 57 affordable apartments to be created on property owned by One Brooklyn Health in Brownsville. It also promised on-site services for seniors and the chronically homeless as well as 24-hour security and various other community services, including a workforce training center and a drop-off point for healthy food. Vital Brookdale LLC—a joint venture between MDG Design + Construction, Smith & Henzy Advisory Group and the Foundling Group—was the third group selected. It aims to build 152 affordable apartments on 40,000 s/f of Brookdale Hospital property with on-site services for the developmentally disabled and young people aging out of foster care. The final chosen proposal came from Federation of Organizations, a social welfare group. It wants to build 119 affordable homes on a 21,000 s/f lot across the street from Interfaith Medical Center in Crown Heights. It will provide housing for seniors, food assistance programs and space for social workers, case managers and nurses to operate on-site. Along with announcing the first four recipients for state assistance, Cuomo also launched a second RFP calling for development proposals for state-and hospital-controlled sites. It targets six land parcels on the grounds of One Brooklyn Health and another on land owned by the SUNY Downstate Medical Center-affiliated Health Science Center at the Brooklyn Foundation. The state wants proposals to incorporate retail and/or community support facilities, green building practices, and public and health and wellness amenities such as open space and attractive streetscapes. Proposals for the next five sites are due by February 28, 2019 and proposals for the following three sites are due by April 30, 2019.